The family of veteran calypsonian Mighty Sparrow (Slinger Francisco) has expressed shock and disgust after false rumours began circulating about the death of the icon on Tuesday. Rumours that Sparrow had passed away circulated throughout the airwaves and on various websites yesterday, prompting shock among many of his fans. His family is calling it a vicious act. Margaret Francisco, Sparrow’s wife, said Sparrow is alive and well and is resting comfortably. She said he is still awaiting results of his recent medical tests. She noted that this is not the first time that death rumours have affected her family. “This is not the first time people are spreading death rumours concerning my husband. I think it is vicious and I hope that the people who started it would understand the effects that they are causing on his family. They are causing unwanted stress for my family,” Francisco said. Sparrow, whose illness is yet to be diagnosed, has been the centre of much attention after appearing in a wheelchair as part of the cast at NAPA Fest. Those who attended the concert saw a mere shadow of the charismatic performer. For as long as most of us can remember, the Mighty Sparrow has been an integral part of the social and political fabric of Trinidad and Tobago. Throughout his five and a half decades as a much-heralded entertainer, Sparrow has won the acclaim and respect of adoring fans throughout the world, but more particularly in the Caribbean and in the West Indian diasporas. The Mighty Sparrow is today expected to receive the results for medical tests he did in New York right before coming to Trinidad for two shows at the National Academy for the Performing Arts (NAPA) in Port of Spain at the weekend. The Mighty Sparrow (Slinger Francisco) made a supreme effort to be on his feet when he performed “Congoman” at the National Academy for the Performing Arts (NAPA) on Sunday night. ALTHOUGH ailing, Calypso King of the World Slinger Francisco (Mighty Sparrow) was declared “still mighty” by many patrons attending the Sunday show at the National Academy for the Performing Arts (NAPA) where the veteran calypsonian was among a cast of performers. It was a sight to make big men cry and some did—seeing a sick Sparrow singing sitting, Saturday, on the NAPA stage capable, it seemed, of less, well, flight than a caged bird. It was not that Sparrow, at 75, was expected to cavort like when he was 25 (even James Brown had to slow down) but that he was not even able to stand was something, disturbingly, else again. Calypso icon Slinger Francisco, popularly known as Sparrow, says he might be suffering from vertigo. Once more, Francisco’s mortality has been the subject of discussion; especially after his not-so-perfect performance at the NAPA Fest, Port-of-Spain, on Sunday night. “My son was a good son, dedicated to policing. I never thought he would have been killed. When he was alive, he never thought it would have happened to him,” is how Rosemary John remembered her murdered son, PC Elton Erickson John. The audience at the National Academy for the Performing Arts (NAPA) in Port of Spain was shocked on Saturday night, as they watched the Calypso King of the World, the Mighty Sparrow, sit throughout his entire performance during NAPA Fest. I heard that Sparrow is dead. Can you please confirm. I really hope its not true, I am praying for him. It was just Saturday I was playing a lot of his songs just remisicing. May the Lord be with him dead or alive. Mighty Sparrow. The Good Lord Bless U Up, Big Time. We Love you. I hope you feel better. Did mighty sparrow passed away last night? 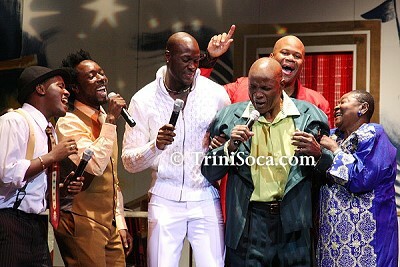 There is no news report about Mighty Sparrow’s passing in any of the media in Trinidad and Tobago. As far as reports go, Sparrow, although currently ill, is still very much alive. Sparrow wishing you all the best and good health, just pray,pray and everything will be okay. We will pray for U.
Trinis are so predictably excitable that it is no longer even remotely funny anymore. A 75 year old musical artist,apparently gets some gas pain, pull a muscle in a rehearsal, and in the process ,forgets a few lines in an on stage performance, and everyone is getting their noses all whack, and out of joint. At the opposite end of the spectrum , a local, dedicated ,hardworking ,off duty Cop, gets shot for telling some criminal degenerate Trini bum, in Tunapuna ,to desist for urinating in public view, and the general reactions could just as well be ,who cares? Pass me the local elections partying hats, for it’s just another day in Wild, Wild West , Lala land. Go figure. Don’t get me wrong ,we love you Birdie, and would like nothing but to see you on stage until age 100, like Roaring Lion, Pretender, or such Kiso geniuses, but folks , let’s develop some perspective here ,can we? Now who is responsible for inspecting gun laden ,business containers coming into T&T again? Oh yes , Police Commissioner Gibbs , and the do it all ,sharp shooter AG Rammy, is working on new protocols ,that would ensure all our boys and gals in blue, have a weapon of choice to also take home ,24hrs per day? Criminals watch out! SPARROW GET WELL. OUR PRAYERS ARE ALWAYS WITH YOU. STAY STRONG.MAY GOD BLESS YOU. All the best to you. Be blessed.